Property Size 1,116 sq. 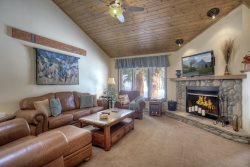 ft.
Durango Colorado vacation rental riverside cabin known as Cranberry Cottage in Hesperus, Colorado. Stay in a piece of local history at this family-owned homesteader's house, now a vacation rental home on the banks of the La Plata River. Please be aware that water flow in the river is seasonal and therefore rises and falls as a result of natural changes in water level due to snow melt and rainfall. The water level varies throughout the year from a raging river to a trickling brook. Please contact us for information about the water flow level in the river. Three bedrooms, one bath and a year-round river running through the backyard of this home just 50 feet from the porch of this 110+ year old house near the old ruins of Hesperus City, from a time when the town was a significant crossroads for travelers heading west and for the old railroad that carried passengers and goods to the ranches and towns of Southwest Colorado. Built in 1905, the homestead is complete with antiques, collectibles, and country farmhouse accents throughout the entire house, providing the charm of yesteryear and the cozy quaintness of stepping back in time. At the same time, this home has been updated to include modern comforts such as WiFi internet, satellite TV, fully equipped kitchen, a gas grill on the back porch and full-sized washer and dryer in the laundry room. The living room and dining room include a gas antique stove, flat screen TV and a ladder to the bedroom loft above. The den / sitting room is includes a large wood stove and is adjacent to the farm house country styled kitchen. Two bedrooms on the ground level each contain a queen size bed. The full bath is in the second bedroom and the laundry room is adjacent to the kitchen. Catch-and-release fishing is allowed (with fishing license) in the river when water flow levels allow, and the sound of a mountain stream is seasonally present at the home since the La Plata River is just a few feet from the cabin separated by a backyard lawn complete with outdoor seating and a picnic table. This historic cabin is located in Hesperus, Colorado which is about a ten minute drive from downtown Durango, the Durango Train and other attractions restaurants and shops. The Kennebec Cafe, long known as a locals favorite for semi-fine dining, is only a two minute drive from this home. Mesa Verde National Park, a World Heritage Site, is a 25 minute drive from this home on paved highway. La Plata Canyon, is also just a few minutes drive to the start of a beautiful Rocky Mountain road that is tame enough for passenger cars at the beginning, but soon becomes 4x4 only, eventually reaching the top of the 12,000 foot peaks of the La Plata Mountains; one of the area’s favorite high mountain excursions close to town. Another popular attraction with a few minutes drive is Blue Lake Ranch / Ridgewood Event Center and Gardens, a beautiful and popular spot for weddings and other events. This home is very private, but please be aware that you will pass a few neighboring homes as you enter the property from the front gate and proceed down the long, private driveway to the cabin. Expect rustic charm, comfort and convenience during your stay. Please be aware that water flow in the river is seasonal and therefore rises and falls as a result of natural changes in water level due to snow melt and rainfall. Please contact us for information about the water flow level in the river. In winter, It is NECESSARY that you have a four-wheel-drive vehicle or AWD , vehicles with medium to high clearance and winter/snow tires. This home has a WELL-MAINTAINED,but long driveway. Bedroom #1 Queen bed, Bedroom #2 queen bed. We so enjoyed are stay at cranberry cottage. It was rustic and beautiful and exactly what we wanted. The snow was beautiful and the cottage was cozy. We would definitely stay there again. Excellent location, fabulous spot I have never rented a home that was so well equipped. There were so many special little touches throughout the house and the home itself was delightful! Marie and Suzanne were always a text away and I wish we'd had more time there. I highly recommend it!